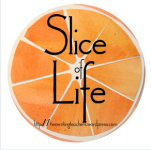 Last year, I hosted a dedicated group of writers for the Slice of Life Challenge. Thirty students took the challenge, and we met each Tuesday as we tried to write every day during the month of March. This year, I'm planning to host a group of students again. I know my obligation to them will keep me going when the writing gets tough and I want to quit. The buzz has been fun. I've listened to students talk to each other about the challenge, recruit their friends, and pick up forms outside my door. I've talked with students who joined me last year, and new students considering joining us. We knowingly understand the challenge and we're ready again. This is just one example of the conversations happening in our building right now. Walking out of my door, I see L paused with her arms crossed. She's staring reflectively at the folder hanging near the window, "Join the Slice of Life Challenge" it reads. "Hi, L," I say as I notice her standing there. The look on her face tells me she is weighing important questions. "What are you thinking about?" I inquire. She shifts her stance from one leg to another. "I'm trying to decide," she says and waits for me to reply. "About Slice of Life?" I ask. "Yes, I'm not sure about it," she confides. I consider her words and her possible uncertainty. I'm familiar with this uncertainty as I feel it every day too. Committing to write for 31 days isn't easy because there will be days the writing won't come easily. I know there will be days the ideas will try to hide from me. I know there will be days I hit the publish button well before the piece is ready to breathe in the world. Of course, I also know there will be days that I will surprise myself. There will be days I find a line that makes me smile. There will be days when my words might connect with others. There will be days in which I only find an idea because I am looking. I know in the end these thirty-one days will make me a better writer. All this uncertainty races through my head, and I focus my attention back on the seven year old watching me, waiting for a response. "I understand," I affirm. "I'm going to write all thirty-one days with you if you decide to try it. I know it won't always be easy, but it will be fun. We can write about whatever we want to write about each day. There will be days the writing will be hard, but I think we can both do it," I say to encourage both of us. We chat for a bit about how our school Slice of Life Club works. She seems comfortable with what I have said and reaches for a form. I'm not sure what she is deciding, but I hope she is planning to join us.